Monty’s wrong – For the fainthearted . . . The BBC’s Gardeners’ World programme has assumed an autumnal mood, a delight in late blooming plants is combined with a tidying up and clearing away in preparation for the winter months. 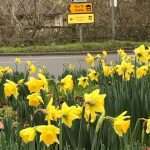 The inimitable Monty Don talked of planting in preparation for the springtime and hoping for a great show of colour from particular flowers when the month of May was reached. Perhaps it suits BBC scheduling to act as though the world outside the double glazed windows enters hibernation from October to March, but the seasons no longer conform to the traditional calendar dates, and there seems to be no reason whatsoever for gardeners to feel that there is a need to wait until the springtime for a revival of growth and colour. Spending seven winters working in Co Laois and Co Offaly, one of the coldest areas of Ireland, it was noticeable that nature had ceased to sleep. Snowdrop shoots began to appear in November and by the end of the year there were clumps of white flowers in country churchyards. Returning to Somerset last year, the year round presence of life and colour was even more conspicuous. 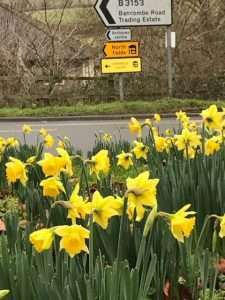 Driving through the town of Somerton on Monday, 25th December, there was a passing thought that the daffodils looked very abundant. A hundred yards up the road, the thought it occurred, “Hold on! It’s Christmas Day? 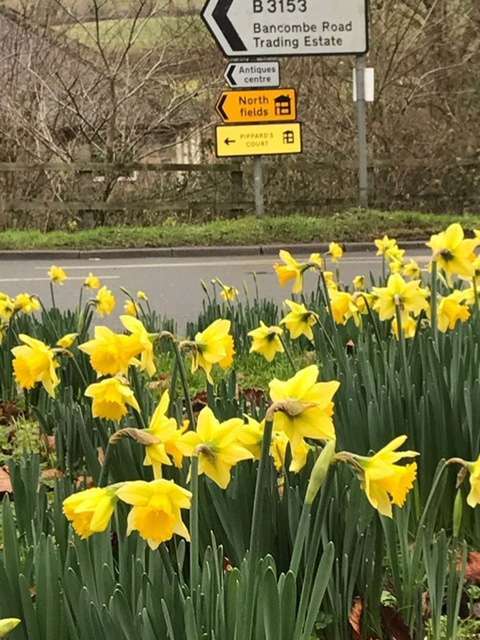 When did daffodils become abundant in midwinter?” Only a photograph was sufficient proof that they had not been imagined. Winter can be as much a state of mind as a meteorological season. It is said that in Austria there is an attitude that there is no such thing as the wrong weather, only the wrong clothes, but perhaps that is easy to say when there are crisp white days with brilliant sunshine and blue skies, perhaps they would feel differently if they lived under a blanket of damp greyness for much of the year. The Irish broadcaster, John Creedon, once commented on his evening programme on RTÉ Radio One that the Irish summer began on 1st January and ended on 31st December. John Creedon’s point was that the Irish weather was so unpredictable that there was a need to grab the chance of a summer day, whenever in the year it might appear. It was a point that underlay a more general attitude of carpe diem, seizing the day, living in the present rather than in some imagined future. As well as talking about colour next May, which is the most beautiful month of the year, Monty Don might also talk about colour in November and December, and in January and February. There are plenty of colourful days in the dark months.